1. Can I use the alarm input from my HAI Omni Pro II security/automation controller to controller to control the recording feature of any combination of 1 to 8 cameras? In other words, can I use HAI alarm input #1 to start recording on cameras 1,3 and 5 and have HAI alarm input #2 to start recording on camers 2,4,6? 2. I assume the above would be done by routing HAI alarm input #1 to a HAI N/O relay. Thus, when the HAI alarm input #1 would activate, the relay would go N/C and thus would create a grounding connection between the + and the – on the DVR which in turn would start the camera recording. Is my assumption correct? Or is there another recommended method? 3. Can I send an email alert to my Gmail account when either/and HAI input #1 and #2 are triggered? 4. Can I minimize the number of emails sent via the DVR software so that I don’t get flooded with alerts? I currently have 8 analog cameras using a Windows based software DVR. Unfortunately, I’m either rebooting the workstation or restarting the software DVR every three or four weeks. I need a solution that is “set it and forget it”. Thus, is the above hardward DVR the solution for me? If you noticed I posted 2 snapshots of the alarm interface of the DVR. You can see on picture #1 you have different options to choose. You can have Alarm input #1 to record 1 or all channels when a sensor triggers. You can also set it to send an email when this events happen. Also you can set to get push notifications on an iPhone or Android Device using TechproSS Pro version when this triggers are activated. Lastly you can see the schedule option have different types of recording, from 24/7, motion and alarm. You can have a channel recording based on motion and alarm and only set the DVR to get emails when an alarm triggers instead of when motion triggers. if you want I can take a picture of the back of the alarm panel of the DVR so you can see the connections. One thing that I will not know is which port you will use from your HAI Omni Pro II panel to connect to the DVR. I guess it will be directly from every alarm inout of the HAI Omni Pro II to the alarm input of the DVR. Specifically, I was thinking about using a Form C relay from my Home Automation Inc (HAI) controller as input to the DVR. The Form C relay can be either N/O or N/C. In this scenario, I believe I would use a N/O relay. A PIR motion detector when tripped would activate the Form C Relay changing its status from N/O to N/C. Unfortunately, I don’t know how to get this Form C output to input into the DVR based on the diagram listed above. In other words, all my PIR’s would trigger one Form C relay in order to get selected cameras into record mode. I have three available Form C relays which should provide some flexibility as to what cameras can be placed into record mode based upon what PIR’s are triggered. this is a megapixel camera, this should work the same way in the DVR, I’m referring to the wiring. The NO/NC of the DVR are alarm OUTPUTS, the number 1-8 are INPUTS. 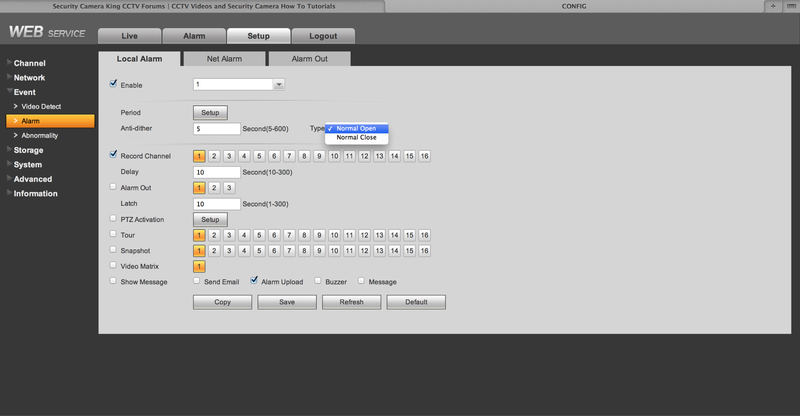 In the main menu, under the settings tab, you will find an alarm section. In here is where you can dictate what each alarm input does as well as if it is a N/O or N/C input. Keep in mind if you are using the TechproSS Plus version of the app, if will push the camera number correlated to the input that is being triggered. Ie. if your input is going into position 3, the primary cameras video that will be pushed is channel 3. Now you can also select the actions that you want the DVR to do through the Alarm section in the menu. 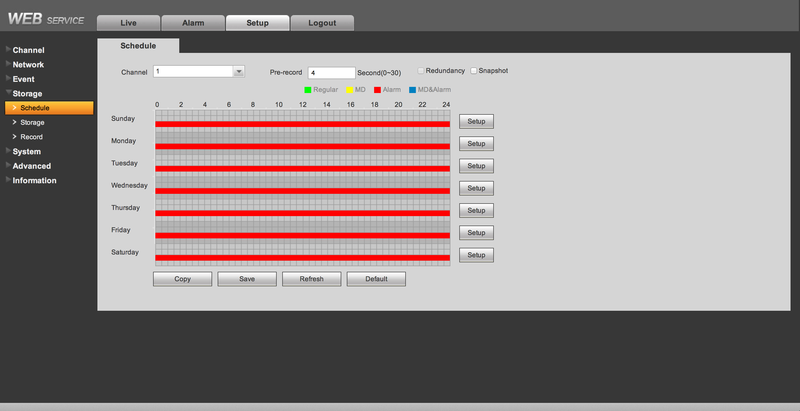 I have a PIR setup to my DVR to help eliminate the false reports from my system. I have it correlated to the channel from my front door so I have the video from that channel pushed to my phone, but I also have the DVR email snapshots from several cameras around my perimeter to give me a fuller view of what triggered the system. I hope this helps. Thanx for the video link. I now understand how the alarm inputs work. I also have the DVR email snapshots from several cameras around my perimeter to give me a fuller view of what triggered the system. Please allow me to ask another newbie question. Are all of these camera snapshots incorporated into one email? For example, input #5 is triggered which will push primary camera 5 using Techpro SS Plus. But since input #5 also starts cameras #1, #3 and #7 to record. Will a snapshot from #1, #3 and #7 be incorporated into one email or will I receive three individual emails? I’m really trying to avoid a flood of emails. My goal is to set up the DVR to set selected cameras to record for 5 minutes when a PIR is tripped. I’d appreciate suggestions to avoid any “gotcha’s” setting up my DVR to accomplish this recording method. Especially, potential email notification issues. I just don’t want to receive a gazillion emails. Thanx again for all your help. It’s really appreciated. The way mine works is I get an email with all the snapshots incorporated into 1 and then shortly after that I get a single, Alarm email with no pictures. It is kind of just a follow up email from the system letting you know an alarm input was triggered. I don’t use the DVR to email the video footage, so I am not 100% sure how that functions, to try and prevent getting too many emails. I utilize the TechproSS Plus to send me the video from the specified input/camera channel. This is generally the fastest way to get the alert. With mine I get the Push Notification from the app followed shortly by the email. I would personally do an FTP video Alarm upload for your specified camera channels, this way you can retrieve the videos at your convenience and not have too large of data being transmitted via email. In email settings in device management in the dvr, there’s a user defined field ‘interval’ field. Also in the snapshot menu, per channel there is a user defined snapshot interval field. I don’t use the feature, but between the two I’m sure you can adjust it to your specific needs. Now, if you have a ptz in line you can get super slick and set a preset for the ptz to jump to as well for a real good look see.